This is one of my favorite holiday activities to do. If I need to clear my mind, I find this activity allows me to do that. While it is not a difficult project, it does take time and it is repetitive which is one of those things that help to relax and calm me. And at the end, I have a beautiful flower ornament. 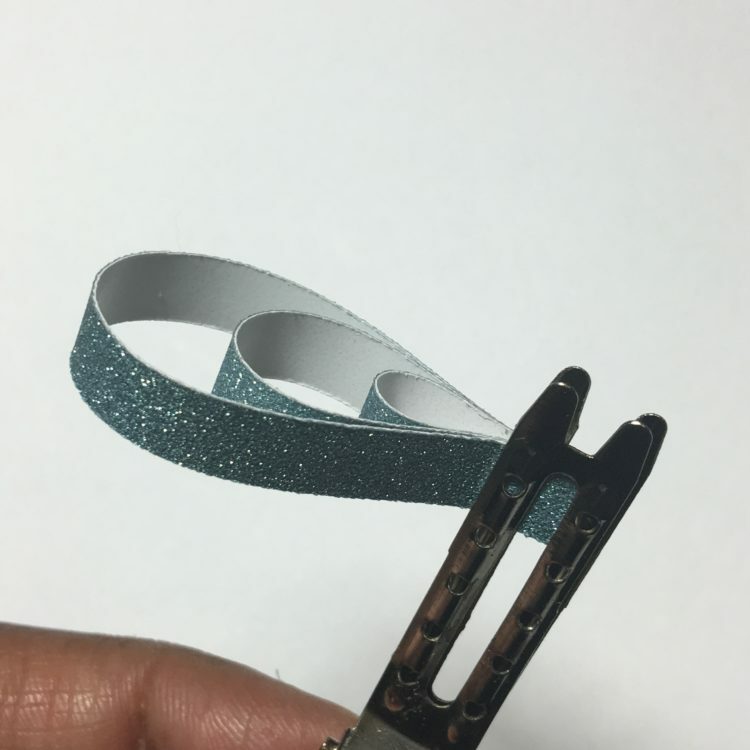 By increasing the size of the strips, you can even use this as a wreath. Check out our DIY below. 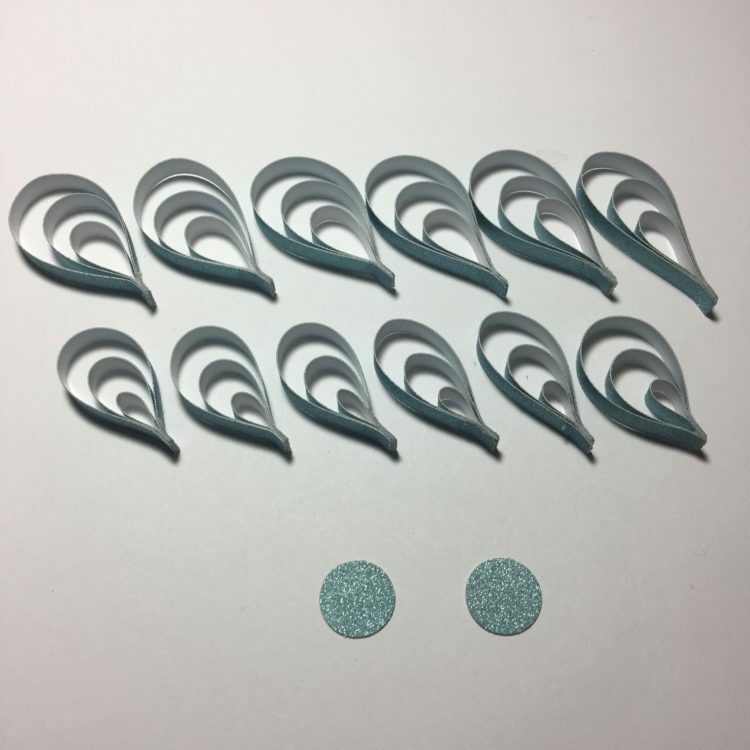 Supplies: 6 sets of cardstock strips cut into the following sizes: (.25″x3″, .25″x4″, .25″x5″, .25″x2″, .25″x3, .25″x4″), adhesive (we used jade but tacky glue works really well), paint brush, wooden dowel to help shape cardstock strips (you can use anything round like a lip balm tube, marker etc. ), binder clips (or our case, toothless hair clips), 6″ inch long fishing wire, 2 1″ circles (not pictured). 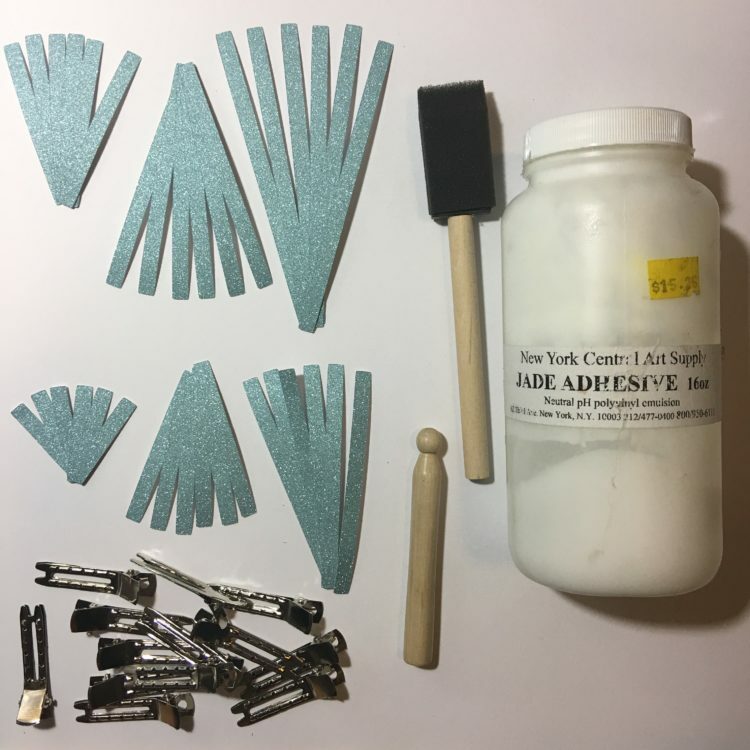 Arrange your paper strips into two sets as follows: set 1 – .25″x3″, .25″x4″, .25″x5″ and set 2 – .25″x2″, .25″x3, .25″x4″. 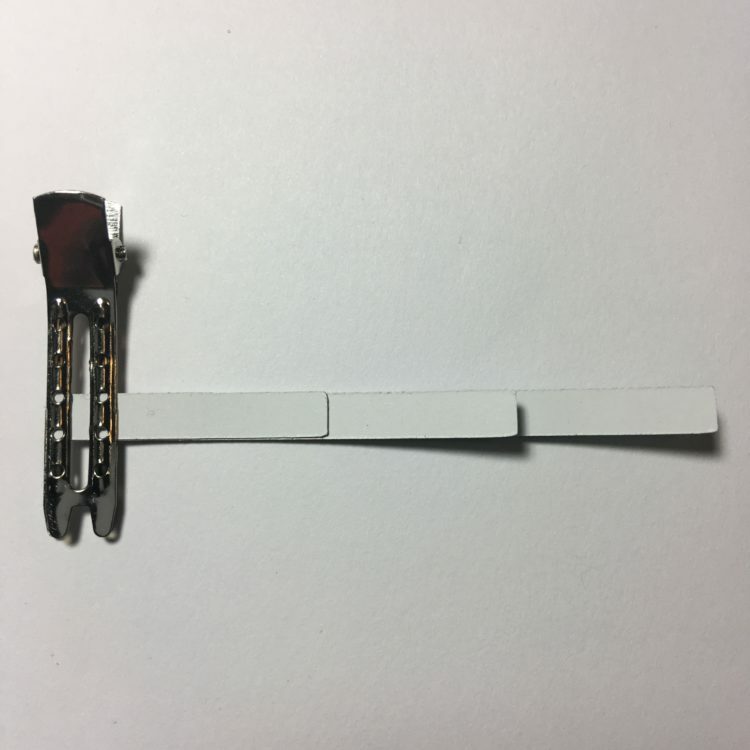 Working with one set at a time, being by glueing the 4″ strip to the 5″ strip and then the 3″ strip on top of the 4″ strip. Repeat the process for the remainder of set 1 strips and do the same for set 2 strips. 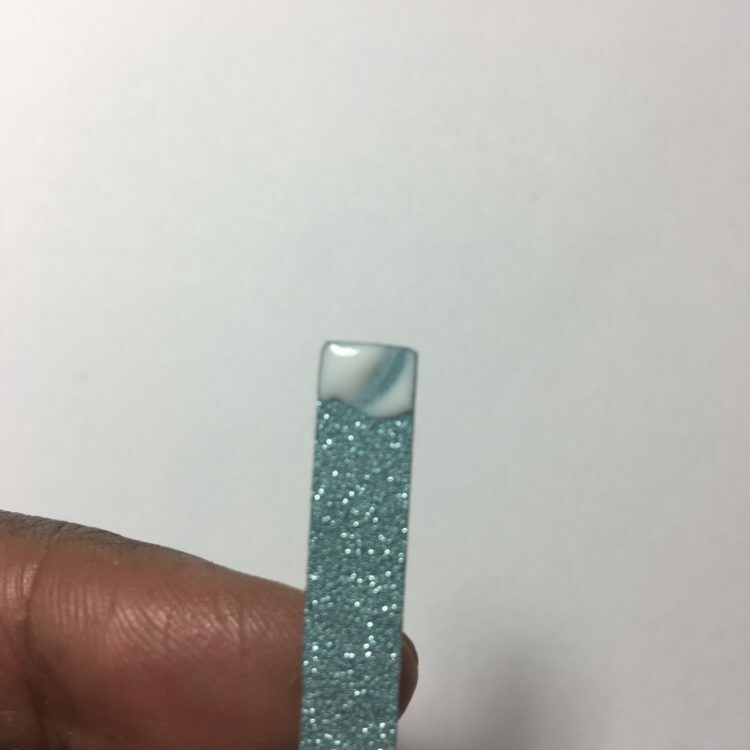 Of note, if using one sided paper like we did for this tutorial, make sure that the glitter side is face down. See the image below. 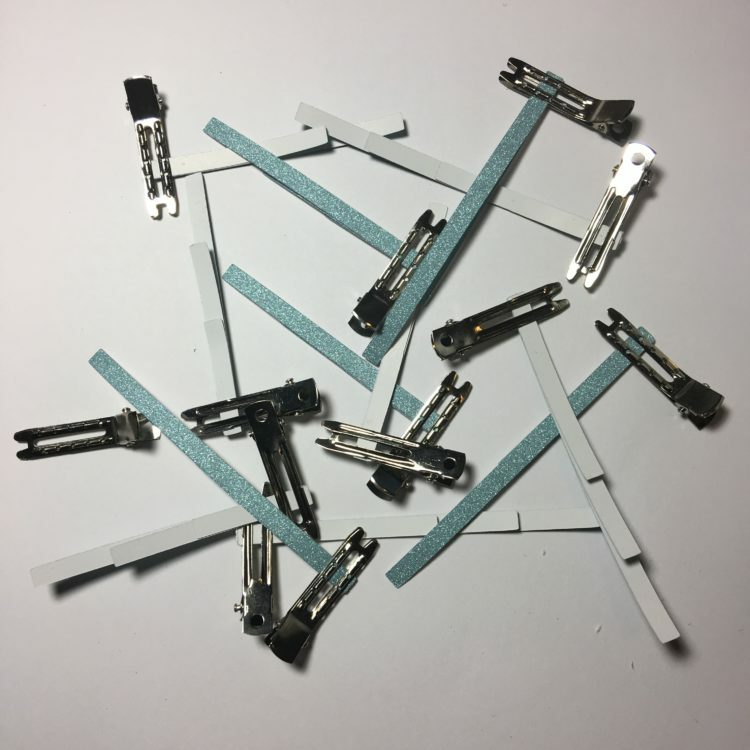 As you glue the sets together, use the binder clips to hold them in place while the glue dries. 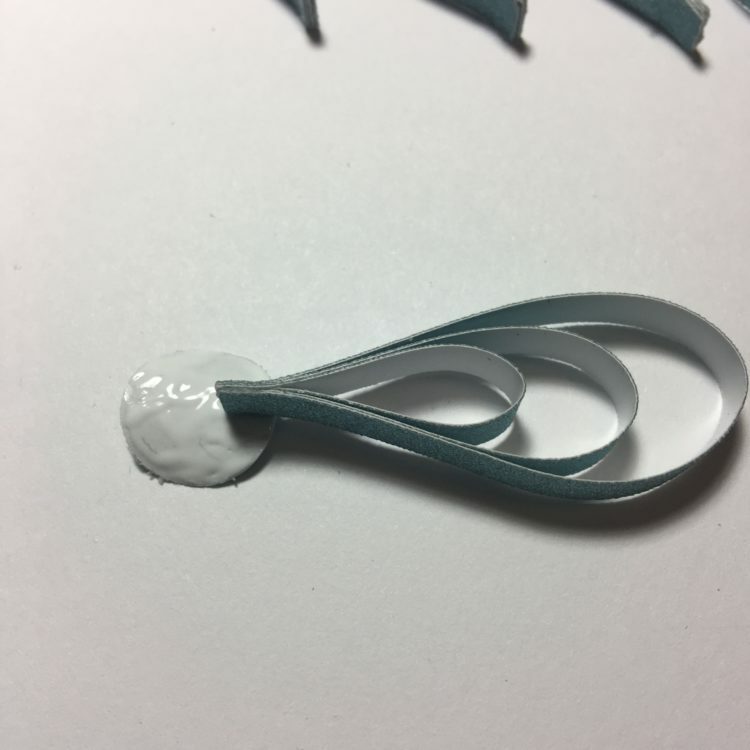 Sets of cardstock glued together. 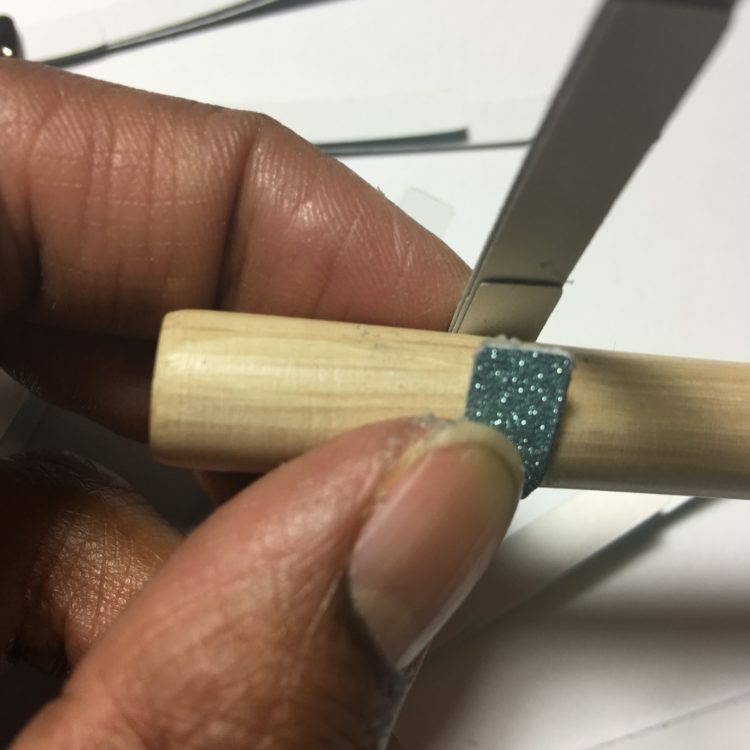 We find that the thicker the card stock used, the more helpful it is to shape the strips over a wooden dowel before glueing. 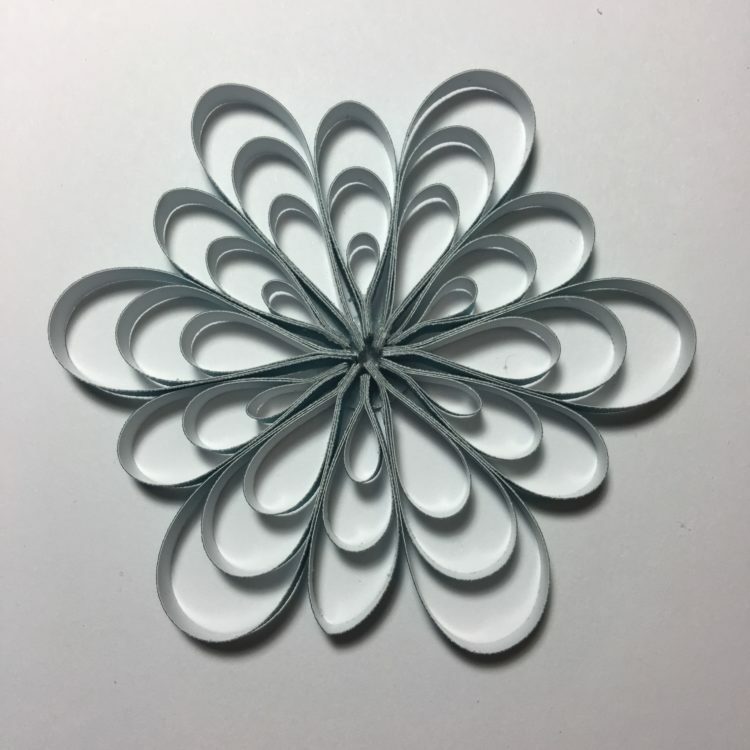 Glue all the strips to create the “petals”. 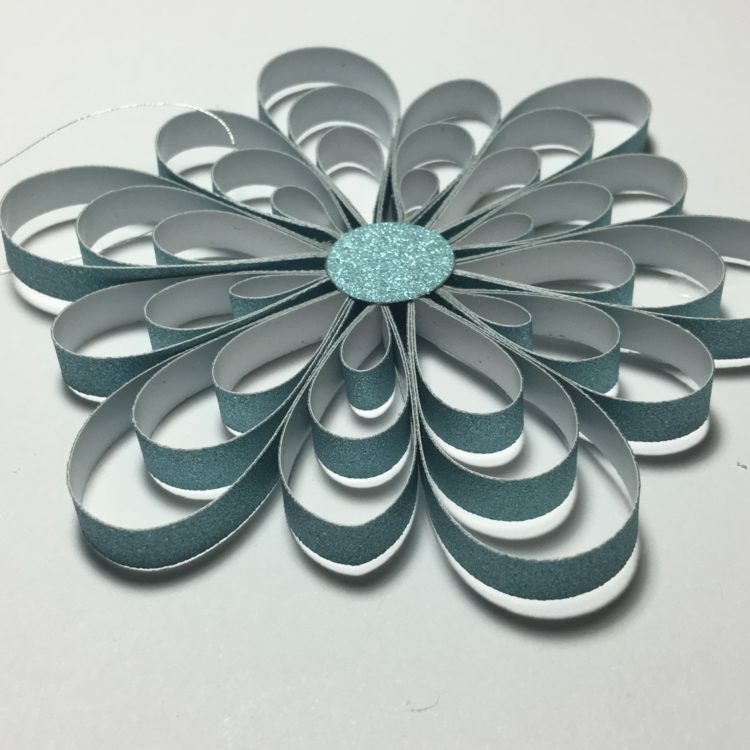 Make sure to align the petal edges. 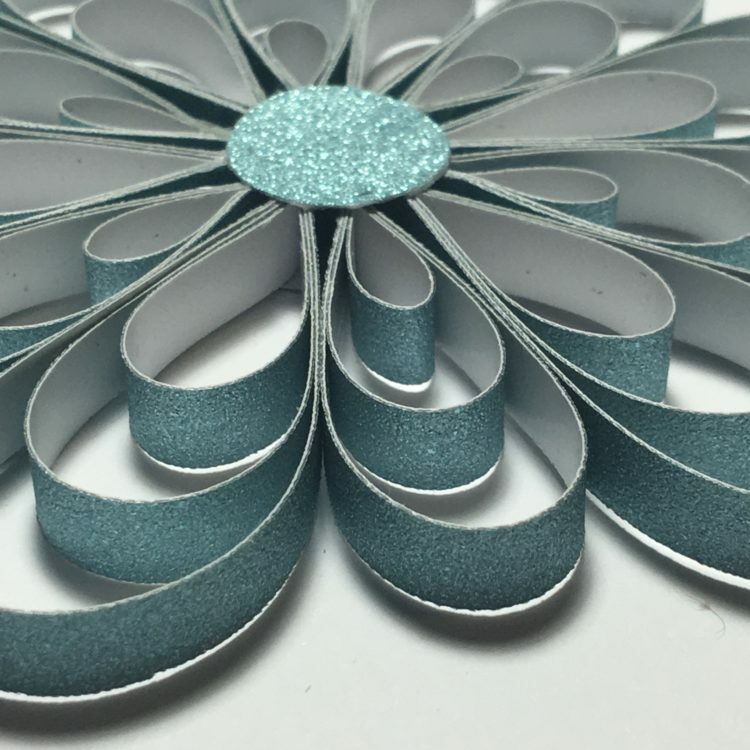 All the petals done along with the 1″ circles and ready for assembly. Apply glue to the backside of the entire surface of one circle. 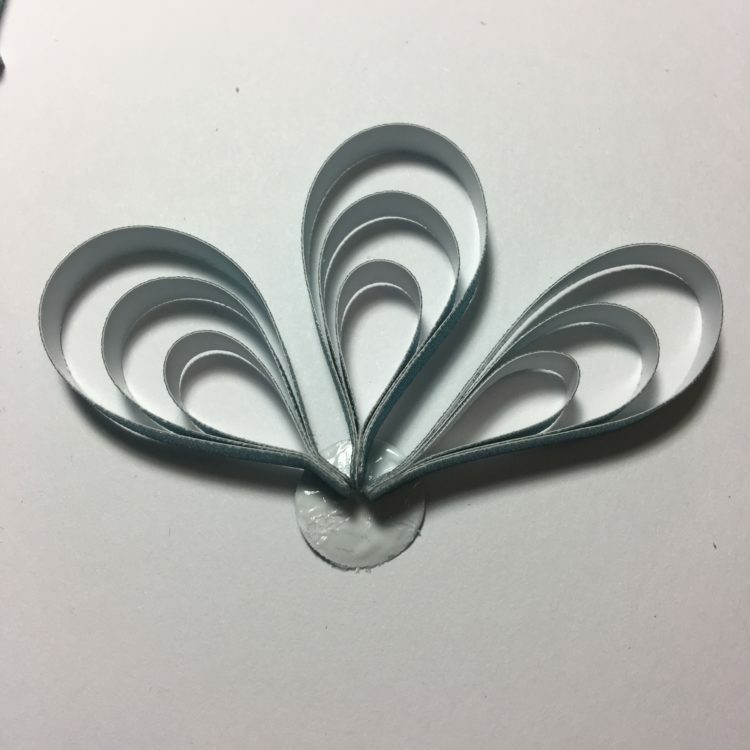 Then take one of the largest petals and place it on the circle, aligning the straight edge of the petal with the center of the circle. Continue placing the large petals making sure to space them evenly. Working carefully, place the small petals in between the large petals. 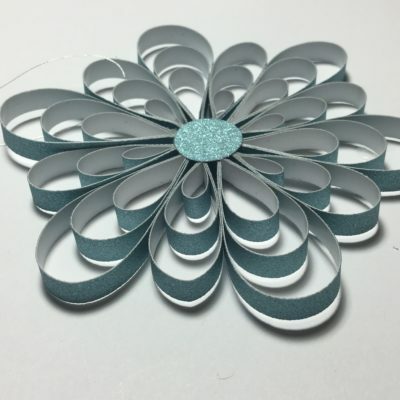 Add glue to the second circle and carefully place it to cover the center to cover the center of the ornament. Align it so that it the circle aligns with the bottom circle. Set aside to dry. Attach the fishing wire around one of the petals and tie a knot. 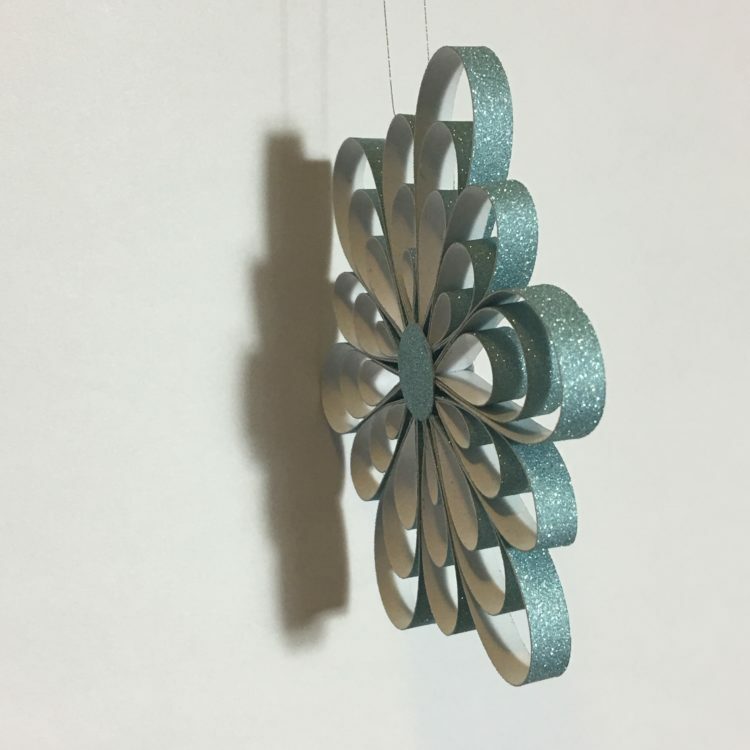 And voila, your flower ornament is all done. I love how the glitter sparkles beautifully in low light.